Their game plan was simple: go out, play hard, and come away with some added confidence before the first round of the playoffs this Thursday. 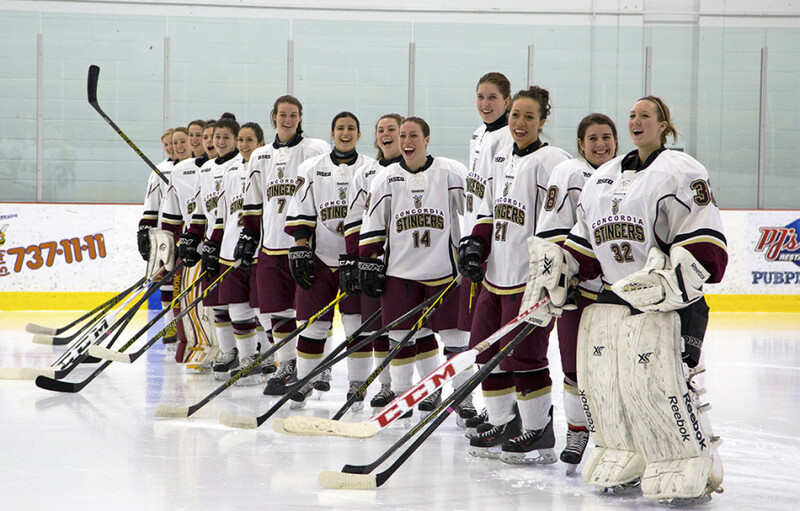 From the looks of things, the Concordia Stingers women’s hockey team brought their work ethic, confidence, and a much needed goal-scoring punch at the right time. The Stingers defeated the Carleton Ravens this past Friday night, and then escaped with a solid 4-3 shootout win against the no. 2 Canadian Interuniversity Sport-ranked Université de Montreal Carabins on Sunday. The Stingers will secure third place in the Reseau de sport étudiant conference in time for the playoffs. Friday’s tilt had the Stingers shaking their heads early, as Carleton scored 2:40 into the game and kept the lead through the first. But in the next two periods, the Stingers offense exploded as five different goal scorers scored to give them a 5-1 win. Rookie goaltender Katherine Purchase continued to impress, stopping 20 to preserve her CIS-leading goals-against-average and save percentage. 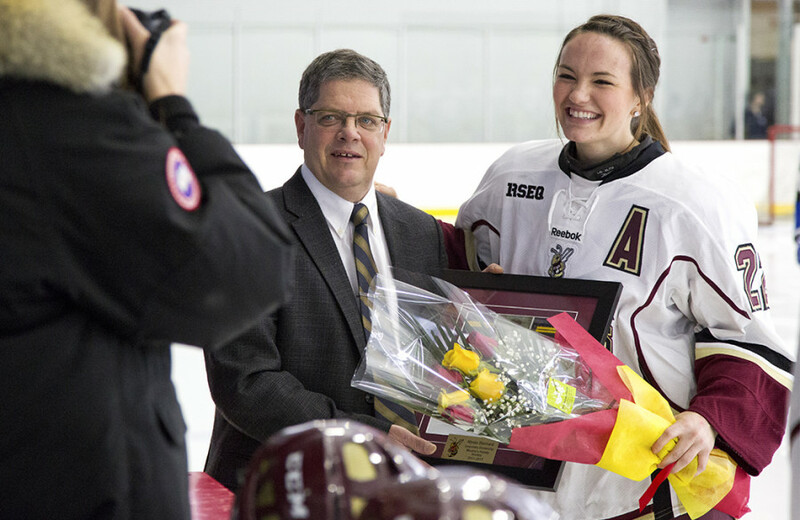 Heading into Sunday’s tilt against UdeM, it was an emotional game for several key members of Concordia who dressed for their last regular season game in the Maroon and Gold. Forwards Audrey Morand, Alyssa Sherrard and Erica Porter were flanked by defensemen Gabrielle Meilleur and captain Danielle Scarlett in a touching pregame ceremony. General manager Caitlin Booth was also honored after three years. Many of the departed’s families showed up on hand for the ceremony, something touching for all. The results of Sunday’s game would help determine whom the Stingers would face in the first round. A win, and they would face Montreal on Thursday night at the CEPSUM, and a loss would set up a rematch of last year’s first round against the McGill Martlets (their bitter foes) on Thursday night at McConnell Arena. After allowing a powerplay goal less than a minute in, the Stingers fought back with two quick goals from Cassiel Lalande-Lajeunesse and Tracy-Ann Lavigne in the first period. The Carabins, who had the chance to take home the RSEQ crown for the first time in their team’s history, scored two quick goals in the second to take the lead 3-2 after two. 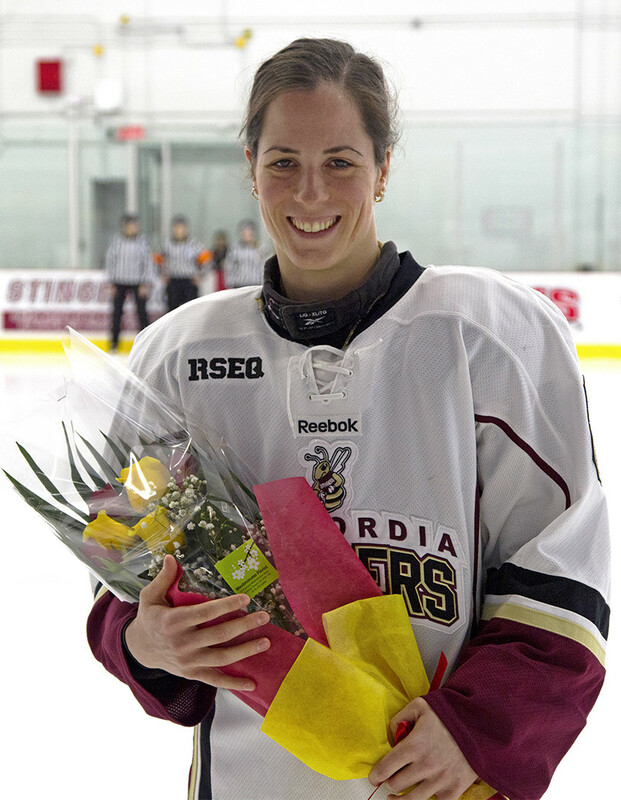 The Stingers showed effort and perseverance in the third, when they launched every puck they could at goalie Elodie Rousseau-Sirois to force more hockey. With seven and half minutes to go, the home team caught their break when forward Valerie Wade took the puck around the slot and took a wrist shot top shelf for her second of the season. After overtime solved nothing, the game was to be decided via the shootout. The Stingers hadn’t had the best of luck in shootouts this seasons, going a woeful 0-4, but that all changed Sunday afternoon at Ed Meagher. After three rounds of nobody solving either Rousseau-Sirois or Bache, it was the Stingers rookie Lalande-Lajeunesse who found the back of the net with a wrist shot. Then it was all up to Carabin forward Rika Pilon-Robert, who couldn’t find the net. Stingers goaltender Briar Bache made 36 saves in the victory, with an added four in the shootout. The victory for Concordia over Montreal was the first time since October 28, 2011. It was also a first taste of being victorious versus them for seniors Morand and Porter. Head coach Les Lawton couldn’t be prouder of his lineup following the great weekend, and the season altogether, finishing with an 8-7-5 record. 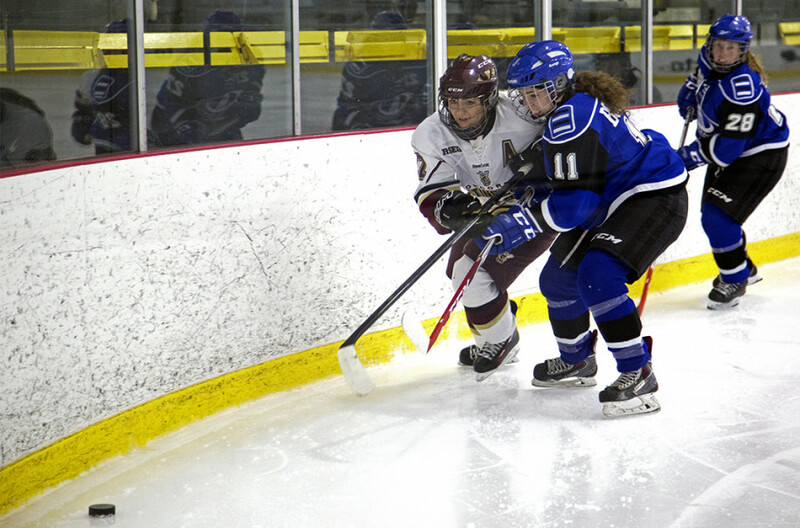 The first game of the Stingers-Carabins best-of-three series will be Thursday evening at the CEPSUM.